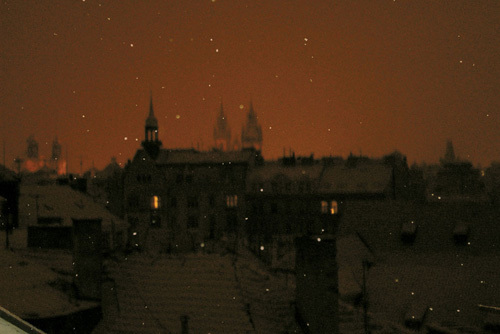 Although not quite a snowy Sunday night in Prague as depicted in the above photograph by Touch co-founder Jon Wozencroft, last week was a substantially chilly one in South London. Thanks to the Atmospheres Festival, however, we were able to derive much warmth from the ambient music, field recordings and, well, ale present at the events. As we previewed recently, London-based audiovisual label Touch closed their year of 25th anniversary celebrations with a week of events held mostly at the Museum of Garden History, with whom they co-organised this festival. We had the good fortune of attending most nights that week (22 - 26 October 2007), and enjoyed the sounds so much that we wish we'd had the stamina to take in every last minute of each of them. Tuesday night's Touch 25 event at the Balham Arms was, on its own, enough to keep us satisfied for months. Beginning with Chris Watson presenting a 14-minute remix of his recent field recording-based Oceanus Pacificus 7", we were immediately immersed in an underwater world of whale song and movement. Watson's skillful editing ensured this was more fantasy than nature documentary, as he crafted a composition of bass-heavy aquatic motion and animal screeches similar to free jazz saxophone skronk. The evening continued with an audio performance from multimedia artist Vicki Bennett, who is perhaps better known under the moniker People Like Us. Although she would return later with a fantastic video presentation about work and play, it was her opening sonic foray that most captivated us. Focusing on the crackle and skip, she spun a soft and hazy repetition, with occasional bursts of noise to keep us from growing too complacent. The giant disco ball hanging overhead, coupled with the room's dim lighting which barely allowed it to sparkle, created an otherworldly atmosphere. As the apparently-living lay strewn about the floor lost in thought, perhaps some unseen spirits were having a ghostly dance. As the most varied line-up of the festival, Tuesday night also saw performances from artists that would play again later in the week. Sweden's BJ Nilsen presented a set of laptop ambiance that sometimes recalled Wolfgang Voigt's work as Gas, with its predominance of choral warmth, hiss and hum. Scandanavian sounds continued as Norway's representative, Biosphere (Geir Jenssen), treated us to a few beats amidst the glacial blur, reminding us of his earlier, more rhythm-driven efforts like 1994's Patashnik. Despite both of these wonderful sets, it would not be until later in the week that these artists would shine brightest. Wednesday night's Museum of Garden History presentation of Storm, Nilsen's field recording collaboration with Chris Watson, was as utterly stunning and unforgettable as one might expect the sensation of hearing rain as if it were falling indoors to be. Both Wednesday and Thursday saw the return of Biosphere, who focused his sets on electronically-altered trombone edits. An exploration of the instrument as well as the human element of its performance, Jenssen underscored the latter by playing his sounds live on a keyboard rather than solely from laptop. The majority of the pieces were short works, many of which illustrated how the instrument might be played if it weren't restricted to the abilities of human lungs. As a tribute to a quarter of a century of Touch, the Atmospheres Festival unfolded quite enjoyably across the week. Not only did it give us an opportunity to experience multiple live performances from some of the world's most interesting musicians, but it also allowed us to become more deeply acquainted with the museum space. During the performance of Storm on Wednesday, we started to lose faith that London still existed outside the walls of the church. Spending most of one's week publicly listening to such introverted sounds, inevitable bonds are formed with the location. We can only hope to enjoy similar events there in future. Photo by Jon Wozencroft, taken from his collection of desktop images for Touch, available here.